In Barrio Logan, Democrats gathered for a "sandal throwing party," planning to chuck sandals at a wall projecting President Trump's State of the Union speech when they hear something they don't like. 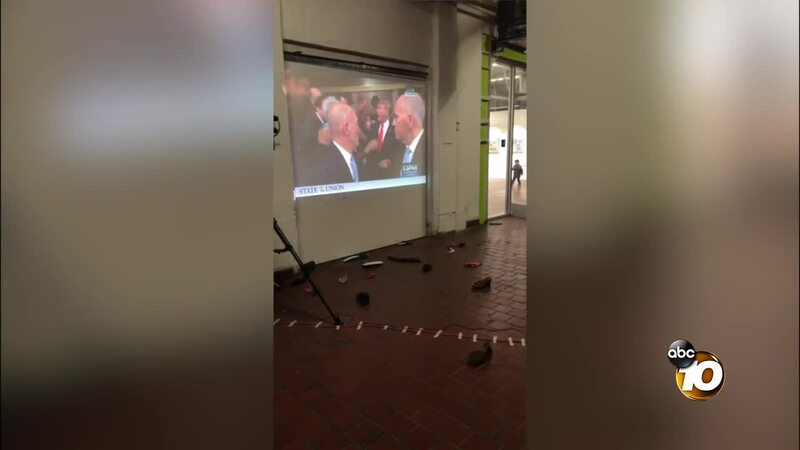 SAN DIEGO (KGTV) -- Some San Diego-based immigrant advocates expressed their frustration with President Trump by throwing sandals during a State of The Union Watch party Tuesday night. The American Friends Service Committee hosted the second annual event at Bread and Salt in Barrio Logan. Organizers say it's a way of injecting humor into serious issues. "It's something that is usually seen as a comedic action that we've seen in many communities and in this case, we thought it would be a good way of offering a cathartic experience for people to react to statements the president makes that will disparage them or their community," said Director Pedro Rios. The biggest boos came when President Trump talked about securing the southern border and building a wall. "What he's doing is still targeting the border communities and exaggerating and lying about the level of safety, the legal asylum processes, and I think that's extremely harmful, to not only the undocumented communities on the border, but also people who are here to legally seek asylum," said Ali Torabi. Torabi is a DACA recipient headed to medical school. He said this year's State of the Union wasn't as divisive as last year. Torabi said he's tired of the president using San Diego as a political pawn. "He's utilizing the people that live in San Diego, within our community, as bargaining chips and they're using our community as a political playground. So, we're used to it, we just need to make sure whatever lies he spews that we counteract it and refute it," said Torabi. Many said they hope the Democrats don't back down when it comes to the wall. "We've seen that border walls don't work. In fact, border walls push people into much more treacherous terrain where people die and, we don't want more people to die. We want solutions that prioritize human rights and human safety and unfortunately, what Trump has proposed doesn't offer that for migrants who are in vulnerable situations," said Rios.